This year’s MU CVM Bovine Club members are (from left) Annie Callahan, vice-president, Kimberly Clem, secretary, Sonja Perry, president, Ashley Zieglar, treasurer, and Alex Jackson, historian. 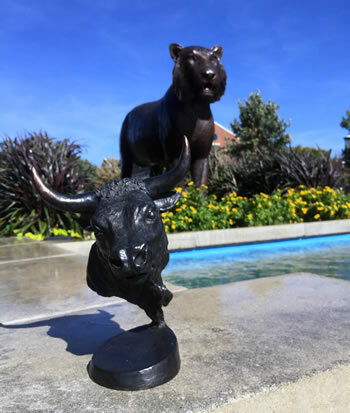 A bronze statue of a bull, which symbolizes a friendly rivalry, is beginning a tour of veterinary schools within the Southeastern Conference at the University of Missouri. 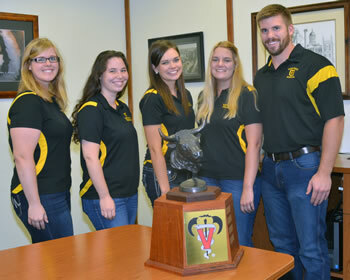 A group of MU CVM alumni who call themselves the Southern Crescent Syndicate purchased the statue during an auction that is part of the American Association of Bovine Practitioners’ (AABO) annual conference. Proceeds from the auction benefit the Amstutz Scholarship Fund for students interested in working in the bovine industry. The bull statue began his tour of SEC institutions at Mizzou. The bull statue has become a returning feature of the yearly auction with veterinarians competing against each other to win the bid and claim bragging rights for their alma mater. University of Missouri alumnus Marvin Smith, DVM ’75, of Eau Claire, Wisconsin, purchased the statue for Mizzou during the conference two years ago. The bull was a resident of the MU CVM for the subsequent year. However, last year alumni from the Ohio State University got together and outbid the competition for the right to display the statue. The Ohio State alumni enhanced the statue with a base that has space for plaques to be added each year with the name of the winning institution. This year, the bull statue returned to the MU CVM thanks to the efforts of the alumni who offered the winning bid of $8,000. The statue spent several weeks back at Mizzou, but has now been sent to its next stop on a tour of SEC institutions. The goal of the SEC tour is to raise awareness of the AABP and increase donations to the scholarship fund. 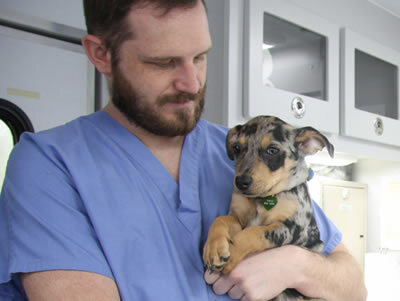 Seven scholarships of $7,500 each are awarded each year to third-year veterinary students involved in AABP.